Swedish Midsummer is the most intriguing occasion representing one of the finest Swedish traditions in the longest day when the sun never sets. This event is to bring Sweden alumni, friends of Sweden and expats together. 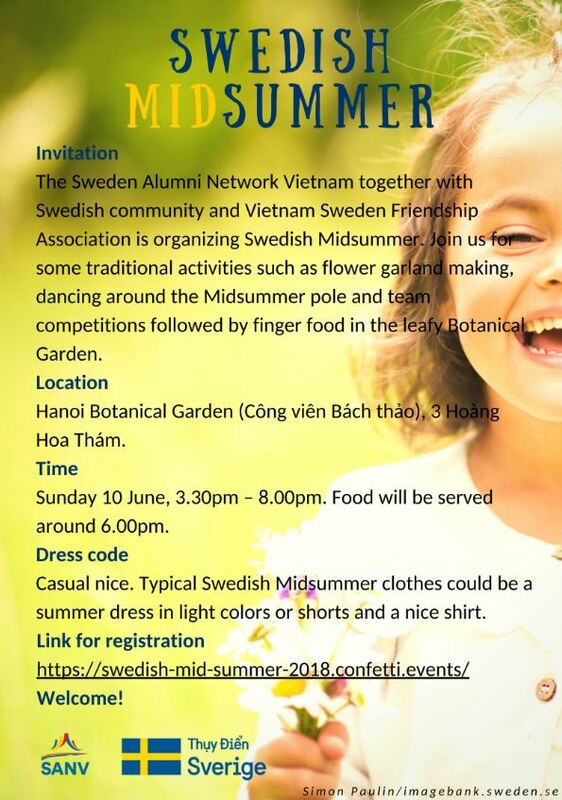 Welcoming speech from: Sweden Alumni Network Vietnam, Embassy of Sweden in Hanoi, Vietnam Sweden Friendship Association. Game play: Tug of war, 3 legged run, jumping bag, pen in bottle, Vietnamese bamboo dance. Register now for this most attractive summer event!